So, what is the point of buying an original piece of art? When you can probably get something much cheaper from (insert name of the home or furniture store of choice) and it can be changed as you update your paint colour. I’d like to share a different perspective. Original art is not just for the investors. In fact I think the vast majority of original art is probably bought from established or up and coming artists like me and my fellow artists for tens or hundred of pounds, rather than thousands of pounds. Probably from small local galleries, local and regional art fairs, open studios and directly from the artists themselves. What are you getting in buying a piece of original art? You have the opportunity to own something unique that is completely original. Not just that, in the creation of the piece the artist has had a relationship with that piece of work. They have applied the paint and materials or melted the metal, worked the clay, carved the wood, blown the glass. If you are buying directly from the artist you can often talk to them and find out about them. Learn what inspired them, hear the story of the creation of the work and even why the artist made the choices they did in the making. In owning the piece you are gifted with the unique experience of owning a creative representation of someone’s perspective on the world. Colour Study, mounted. £30 in my Etsy shop. You can start small. Lots of artists will make their sketches or smaller works available for sale. These can be a great way to start your original art collection. For example I have done a couple of projects this year in support of my art practice one was the 100 Day Challenge where I did a small abstract collage a day. This inspired some small collage works on paper. The second was an exercise shared by Louise Fletcher which resulted in a whole host of small colour studies. These works are all available in my Etsy shop for under £40. You might also like to check out Alice Sheridan’s recent post on this topic, Alice has some good tips about how to decide what to buy. 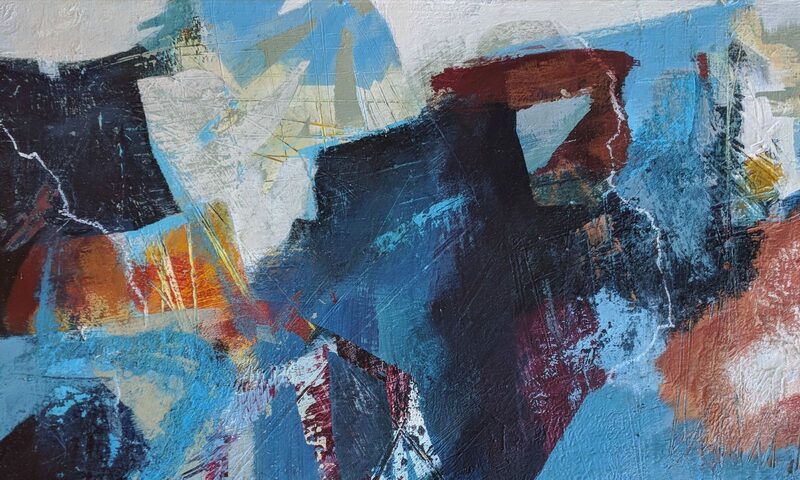 Choosing a piece of original art allows us to connect with our own inspiration and the things that move us. We have the chance own original work that appeals to us deeply. Sometimes we will not know why we like something just that there is something about it that appeals to us. We may not even be able to put it into words. I think these kind of experiences are worth having. To sit in front of a piece of art that brings you pleasure year after year, to be moved and inspired. How did you begin collecting original art? What was your first piece? Do you still love it? I’d love to hear your experiences.